So I finally finished tallying the entries from my China Glaze Mini Set Anchors Away Giveaway. 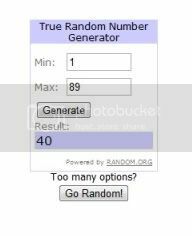 Congratulations to Saroun, who was lucky number #40! Thank you for all those who entered, I'll have another giveaway soon.